Artificial leaves (and pinecones if you want more variety), these can be found at the Dollar store, Walmart, Hobby Lobby or any craft store. Paint brush, bigger and flat works best. Glitter! You will want to get a couple of colors of glitter like gold, brown, copper, orange. Any colors that speak to you and make you think of fall foliage glittering in the sun. Shoe box or disposable containers to contain the glitter mess, or newspapers laid down on your work surface. 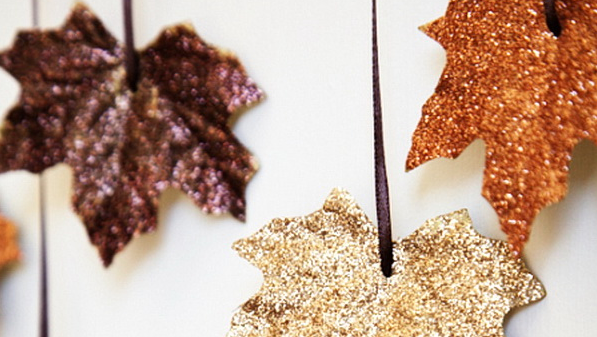 Twine or ribbon for stringing your garland and a hole punch for your leaves. Alright we got our supplies, now we can begin! Separate your leaves and pinecones into piles for each color you have. Next apply your glue using your paintbrush. Then holding your leaf over your container or work area shake on your glitter. Lay out your leaves to dry. Once your leaves are dry you can use the whole punch at the bottom where the stem would have been. Then string up your leaves using your ribbon or twine. If you also used pinecones you can tie the ribbon or twine around the stem. Now hang up your masterpiece to enjoy through the rest of the fall season! A variation is to use a long stick and tie your leaves so they hang from the stick. You can use your ribbon, twine, or invisible wire. Whatever you do have fun and be creative.